I love baking! There are few things I enjoy more actually. Especially during this time of year. Now that we have a range (Merry Christmas from my Daddy) I cannot wait to dive into my holiday baking! I am thinking about doing some sort of pie to take to the grandparents house for Thanksgiving. I haven't completely decided on that yet. Then of course I need to bake Tristen a cake for his party on Saturday, that won't be too hard. I will be working my new range hard on Sunday though, as that is when Dan, the kids, and I will be having our Thanksgiving feast! Then I'll be moving on to the Christmas baking. I try to do it all December long and then pp things in the freezer. Here are some recipes I am very interested in trying. They came from Recipezaar, which is one of my favorite websites! 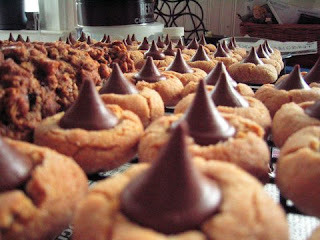 And of course I'll be making peanut butter blossoms, pictured above, they are a family favorite! What are your favorite holiday baked goods? I'd love to hear wait you traditionally bake and get some new recipes if y'all would like to share. We always make shortbread in an 8x8 dish and then cover it with Nutella. It tastes so good...you get the shortbread taste with a touch of chocolate. Mmmmm! This is making me think about posting some goodies recipes on my site in December. Thanks for the idea! Oh! For the love of chocolate! YUMMMYYYY! You know I love me some sweet chocolately stuffs! Happy Thanksgiving, my dear, sweet friend! denea's fav is sugar cookies w/red hots in them. shoe fly pie! have you had it?! oooooh heaven in a pie pan. I am fairly certain it is an Amish dessert, so I dont know how many people around the states have been able to sample its gloriousness! When it comes to baking, I usually stick to homemade chocolate chip and sugar cookies... mmm. This year though I'm going to try my hand at cheesecake.. still pretty simple... right? Because I need simple, lol. Bekah - I LOVE shoo fly pie! I've only had it like twice (on a visit to Amish Country in PA) and it was HEAVENLY. I love baking as well. I am always looking for new recipes. Last year I made mexican wedding cookies and peppermint bark. Yummy, they were both good!